Germany needs ‘small miracle’ to avoid recession after exports fall by 5.8% | Business | The Guardian. German exports suffered the biggest monthly fall in more than five and a half years in August, leaving Europe’s largest economy in need of “a small miracle” to avoid recession in the third quarter. 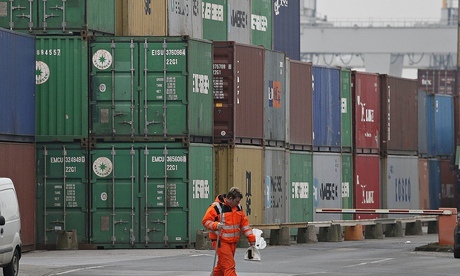 Exports fell by 5.8% compared with July to €92.6bn (£72.8bn). The decrease is the latest sign of a sharp slowdown in Germany, which has been hit by sanctions between Russia and Europe and a flagging economy in the wider eurozone. The fall in August was the biggest since January 2009 when the global economy was in turmoil following the collapse of US investment bank Lehman Brothers. It was a sharper than the 4% forecast by economists, and followed a 4.8% rise in July. Germany’s economy shrank by 0.2% in the second quarter, so a second consecutive contraction in GDP in the third quarter would tip it into a technical recession. Carsten Brzeski, economist at ING, described the current situation in Germany as a “horror story”. The exports fall pushed European markets lower and contributed to a 0.8% drop in the FTSE 100 to 6,431.85, its lowest close in a year. The data from Destatis, Germany’s federal statistics office, showed imports also fell unexpectedly in August by 1.3% to €75.1bn. Economists had forecast a 1% rise in imported goods. Destatis said the weakness in August could partly be explained by the later timing of summer factory shut downs because of later school holidays in some areas. Economists said the impact of sanctions between Russia and Europe, as well as slowing economies in some of Germany’s key export markets, were also weighing on the country’s economy. The German finance minister, Wolfgang Schäuble, played down the suggestion that Germany was on the brink of recession. “We don’t have a recession in Germany, we have a weakening of growth,” he said, speaking in Washington where he is attending the World Bank and International Monetary Fund meetings. The IMF has downgraded its growth forecasts for the German economy for 2014 from 1.9% to 1.4% and for 2015 from 1.7% to 1.5%. The poor export performance in August was the latest in a recent string of weak German data. Earlier this week, figures showed industrial production slumped 4% in August, a far bigger drop than the 1.5% fall predicted by economists. It was also the sharpest fall since January 2009. Investor confidence has fallen for nine consecutive months according to the closely watched ZEW indicator of economic sentiment. Christian Schulz, senior economist at German bank Berenberg, said the sharp decline in exports completed “the round of disastrous German industrial data for August”. But he added that the picture was not so bad when the impact of the later timing of the school holidays was stripped out.